Red Hat System Administration II (RH135) focuses on the key tasks needed to become a full time Linux administrator. This course goes deeper into enterprise Linux administration including file systems and partitioning, logical volumes, SELinux, firewalling, and troubleshooting. Attending both Red Hat System Administration I and Red Hat System Administration II can help you in your preparation for the Red Hat Certified System Administrator (RHCSA) Exam (EX200), which is included in this version of the course. This course is singularly designed for students who have completed Red Hat System Administration I (RH124). The organization of topics is such that it is not appropriate for student to use RH134 as a curriculum entry point. 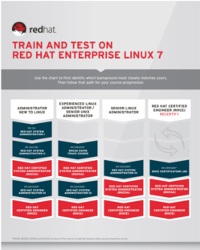 Students who have not taken a previous Red Hat course are encouraged to take either System Administration I if they are new to Linux, or the RHCSA Rapid Track Course + EX200 (RH200) if they are experienced with enterprise Linux administration.